Bill Jennings, executive director/chairman of the California Sportfishing Protection Alliance, said everybody concerned about restoring Central Valley salmon and Delta fish populations should strongly oppose the DFG proposal. "This proposal is based on bogus science and is a capitulation to those who are attempting to shift responsibility for the Delta collapse from the export pumps to the fish - and who are blaming the victims of water exports for the collapse," Jennings explained. 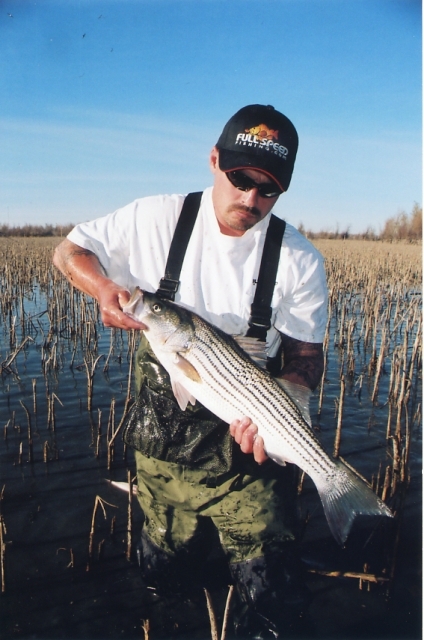 Photo of volunteer holding up a live striped bass stranded during the Prospect Island Fish Kill of November 2007 prior to a historic rescue effort by anglers. Photo by Dan Bacher. The California Department of Fish and Game (DFG) on Friday, November 4 released a draft of proposed recreational fishing regulation changes for striped bass, a species that is avidly pursued by anglers on the Sacramento-San Joaquin Delta and San Francisco Bay. The proposal would raise the daily bag limit for striped bass from two to six fish; raise the possession limit from two to 12 fish; and lower the minimum size from 18 to 12 inches. The proposal is strongly opposed by the California Striped Bass Association (CSBA), California Sportfishing Protection Alliance (CSPA) and other fishing groups, who accuse the DFG of caving in to the wishes of water contractors who want to export more water from the Delta by building a peripheral canal. The liberalized regulations were spurred by a settlement between the DFG, NOAA Fisheries and the Coalition for a Sustainable Delta, an agribusiness astroturf organization that sued the DFG for managing striped bass through fishing regulations in a thinly-veiled attempt to divert attention from the export pumps that have devastated fisheries. The Coalition claims that the striped bass, an East Coast fish introduced to the Sacramento over 120 years ago, should not be protected because the fish supposedly prey on protected chinook salmon and Delta smelt. Since winter run and spring chinook salmon and Delta smelt were listed under the state and federal Endangered Species Acts, the federal government, with little or no scientific evidence, has claimed that striped bass "predation" is a factor in the decline of salmon and smelt. To address widely-contested "concerns" about striped bass "predation" on winter-run Chinook salmon by NOAA Fisheries, the DFG temporarily stopped stocking striped bass in 1990. The DFG worked until 1999 to receive federal permits from the USFWS and NOAA Fisheries to begin stocking striped bass again and in 2000 suspended all stocking to address concerns about several listed fish species in the Central Valley.The DFG and NOAA also suspended a wildly successful pen rearing program, conducted by the Fisheries Foundation of California, that raised striped bass salvaged in the Delta pumps until they were large enough to fend off predators. Anglers believe that the program helped raise the number of striped bass up to an estimated 1.5 million fish over 18 inches in 2000, still a far cry from the millions of stripers that thrived in the Bay Delta Estuary in the mid-1960s. The current population estimate is around 600,000 fish over 18 inches. "Controversy over striped bass management peaked in 2008 when the Coalition for a Sustainable Delta sued DFG under the federal Endangered Species Act, seeking to require the department to apply for federal permits to enforce one of the fishing regulations that limits sport harvest of striped bass," explained Marty Gingras, DFG Region 3 fishery biologist. "Both as part of a settlement agreement and as a result of continuing work by USFWS, NOAA Fisheries and DFG to recover the listed species, DFG and the federal agencies developed the proposal to modify striped bass fishing regulations in an effort to reduce striped bass predation on the listed species." Gingras claimed, "Striped bass are known and/or expected to prey on listed Chinook salmon, coho salmon, steelhead, delta smelt, longfin smelt and tidewater goby. While the extent of striped bass predation on listed species cannot be precisely determined, the best available science indicates that the impact could be substantial." "Although the amount of impact attributable to striped bass predation is not certain, DFG strongly suspects that the impact can be reduced by the proposed regulations," added Gingras. "With the proposed changes, striped bass would likely become somewhat less abundant and the average size of striped bass would decline, but fishing effort and fishing success would likely increase for a period of at least several years." However, numerous prominent scientists and representatives of fishing groups counter that massive water exports to corporate agribusiness and southern California and declining water quality and habitat destruction, not striped bass, are the primary cause of the decline in Central Valley salmon and Delta smelt. They argue that striped bass, salmon and Delta smelt populations all thrived together until the massive state and federal pumping facilities went into operation. He noted, "Striped bass and salmon populations on the East Coast of the US have co-existed and thrived for thousands of years. So to conclude that striped bass in this ecosystem are causing the decline of salmon and other species has no credible scientific basis and in my opinion is absurd." Fishery scientist Dr. Tina Swanson, when serving as executive director of the Bay Institute, described the striped bass as "like a naturalized citizen" in the estuary that has become a part of the ecosystem during her testimony at a State Water Resources Control Board meeting in 2010. In fact, Dr. Peter B. Moyle and William A. Bennett, Center for Watershed Sciences, point out that decreasing the population of striped bass could possibly have a negative impact upon salmon and smelt by changing "basic ecosystem processes." "Reducing the striped bass population may or may not have a desirable effect," according to Moyle and Bennett (http://calsport.org/news/wp-content/uploads/2011/03/Moyle-and-Bennett-to-CFGC-20100826.pdf). "In our opinion, it is most likely to have a negative effect. While the ultimate cause of death of most fish may be predation, the contribution of striped bass to fish declines is not certain. By messing with a dominant predator(if indeed it is), the agencies are inadvertently playing roulette with basic ecosystem processes that can change in unexpected ways in response to reducing striped bass numbers." Representatives of fishing groups accuse the DFG of buckling to pressure by corporate agribusiness interests by agreeing to the settlement rather than continuing to fight the Coalition in court. "CSPA, Northern California Council Federation of Fly Fishers (NCCFFF) and the California Striped Bass Association (CSBA), as well as Delta water agencies, intervened, at great expense, in the lawsuit in support of DFG," said Bill Jennings, executive director/chairman of the California Sportfishing Protection Alliance. "CSPA was looking forward to trial because the evidence in the record did not support the conclusion that striped bass predation caused population level effects on salmon and smelt. Unfortunately, feeling the pressure of escalating legal costs, DFG caved and cut a deal. CSPA, NCCFFF, CSBA and the Delta agencies opposed and refused to sign the settlement agreement." "It appears the Department of Fish & Game has caved into the lawsuit filed against striped bass by the Coalition for a Sustainable Delta, which is based out of Kern County and consists of agricultural interests who want Delta water," said Roger Mammon of the California Striped Bass Association, West Delta Chapter, and a board member of Restore the Delta. "It is extremely important that everyone valuing the striped bass as a resource and the Delta as our home attend this meeting to let Fish and Game know that we are not happy with this regulation change proposal." Cal Kellogg, Editor of the Fish Sniffer magazine, emphasized, "Any way you look at this, it is a poor, irresponsible decision by the DFG. If all stripers were gone tomorrow, we don't know if it would have a positive, negative or no effect on the estuary. Yet we do know that when our salmon runs were strong before the beginning of water exports, the striped bass population was also at its apex." Jennings said everybody concerned about restoring Central Valley salmon and Delta fish populations should strongly oppose the DFG proposal. "This proposal is based on bogus science and is a capitulation to those who are attempting to shift responsibility for the Delta collapse from the export pumps to the fish - and who are blaming the victims of water exports for the collapse," Jennings explained. Jennings emphasized that if the Fish and Game Commission rejects the proposal, the Coalition for Sustainable Delta must drop its lawsuit with prejudice. "If the Commission passes the proposal, they face a lawsuit in state court," said Jennings. To accommodate the large number of anglers expected, the scheduled public workshop at 7 p.m. on Tuesday, Nov. 8 has been moved to a larger venue. The new location is the Rio Vista & Isleton Club, 295 South 7th Street, Rio Vista, 94571. It is ironic that the same Obama and Brown administrations that have agreed to demonize striped bass as “predators” are fast-tracking the Bay Delta Conservation Plan (BDCP) to build a peripheral canal or tunnel, a project that will result in the extinction of Delta and longfin smelt, Central Valley steelhead, Sacramento River chinook salmon, green sturgeon, Sacramento splittail and other fish species. And the same state and federal governments that are pushing for the peripheral canal exported record levels of water from the California Delta this year, resulting in the "salvage" of over 11 million fish, including 9 million Sacramento splittail, in the Delta "death pumps." Establishing a “hot spot” for striped bass fishing at Clifton Court Forebay and specified adjacent waterways at which the daily bag limit will be 20 fish, the possession limit will be 40 fish and there will be no size limit. Anglers fishing at the hot spot would be required to fill out a report card and deposit it in an iron ranger or similar receptacle. The proposal and management plan will be presented to the Fish and Game Commission for consideration at its December meeting. For more information about the DFG's draft striped bass proposal, go to: http://www.dfg.ca.gov/news. Listed below are the latest comments posted about this article.